The computer letterer does his work over scans of inked art pages and has the same responsibilities as the hand letterer. His tools, however, are very different. Although you can create computer lettering on any PC, it is important to note that most of the comics (and publishing) industry favors work generated on Macintosh computers. Make sure you have plenty of processing and storage RAM, and also a good printer so that you can print out proofs of your work for the editor to approve. Most computer letterers use the software program Adobe Illustrator to create their work. This provides your pens, pencils, rulers and balloon guides — in short, everything the traditional letterer is accustomed to doing by hand. If you want to enjoy the full benefits of lettering with a computer, you should invest in a font creation program like Fontographer. The most important item you’ll need to create is a copy of your basic lettering styles in the form of two or three computer fonts (ROMAN — or UPRIGHT — Lettering; ITALIC and BOLD ITALIC). However, you might prefer to purchase one of the fonts that are commercially available. You won’t need to know the inner workings of your computer and all its programs to become a good letterer any more than you would need to know the inner workings of a car in order to become a good driver. Nevertheless, you will need to read the software manuals and spend time refining your craft. Richard Starkings and John Roshell at Comicraft originally spent many months tweaking fonts based on Richard’s hand lettering styles before they passed the scrutiny of Marvel’s editors. The letterer shares the same goal as the writer and artist: storytelling. 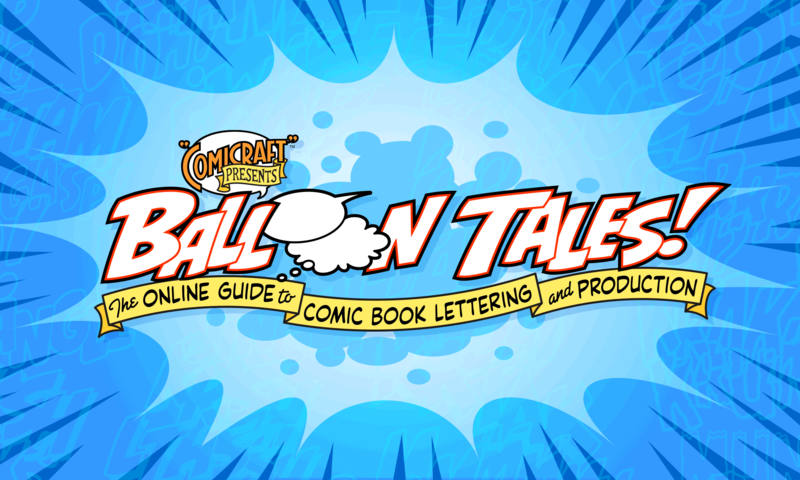 As a lettering artist, foremost in your mind should be the flow of the story from balloon to balloon and from panel to panel. Your lettering placement should not interfere with the dynamics of the story and art. Letters should always be crisp and clean and as easy to read as possible. The computer will help you make basic letters more consistent, balloons rounder and caption boxes straighter, but it will not turn a bad letterer into a good letterer any more than would a new pen. However, given enough patience, time and practice you may eventually wonder how lettering was ever done any other way. After inked artboards have been delivered to the editor, they are the passed to the production department which produces high-definition scans for delivery to the company or individual responsible for the color separation of the book. Production then produces low-definition copies of those same scans and transmits them to Comicraft via an online service or remote access computer link-up. Comicraft drops each scan into an Illustrator document. Once in place, the scans are used as templates for lettering — in much the same way that a hand letterer would use a xerox of artwork as a guide for lettering when he is providing his work on a vellum overlay. The Comicraft letterer then transcribes the dialogue, sound effects, captions and titles indicated by the writer — always keeping an eye out for characters who should be given special ‘voices’. (This effect is created by a unique balloon shape and/or a distinctive lettering style.) In the course of lettering just one page of artwork, Comicraft might utilize anywhere between one and fifteen different fonts. Once the editor has indicated corrections and approved revised proofs, Comicraft transmits the lettering files to the publisher or color separator, where they are married electronically with color files prior to film output. THE COMPUTER WILL MAKE YOU A FASTER LETTERER. By hand I could letter perhaps 10 to 12 pages on a quiet 7 hour work day. On the computer, accounting for time spent scanning pages, I might be able to letter 8 to 10 pages in the same amount of time. THE COMPUTER WILL MAKE YOU A BETTER LETTERER. A computer will make basic letters more consistent, balloons rounder and caption boxes straighter, but it will not make you a better letterer any more than would a new pen. It may reduce the amount of frustration you experience (if the bullpen loses one of your overlays, you can simply reprint it), but it can also replace that frustration with another (this you’ll appreciate the first time your computer crashes on you just as you finish a page that you didn’t save). Many years ago at the San Diego Comic Con, standing amongst the throng, Tom Orzechowski and I were amiably discussing the art of lettering. I had not thought much about computers till then, but somehow decided to mention a SHADOW project which I knew had been lettered with computer fonts. Suddenly, Tom’s face colored, his hair stood on end and he seemed to be having difficulty with his breathing. “Cold Letters must be Warmed by the Living Hand!” he boomed, then stomped away, leaving me bewildered and alone. To be fair to Tom, our conversation didn’t quite happen that way, however his thoughts did spike my curiosity and thereby set me on the path I’ve followed to this day. I enjoy a challenge, and pride myself on always trying to improve my own work and improve conditions for all letterers in the industry (when I worked on staff at Marvel UK, I used my influence to ensure that lettering rates there were higher than at any other company). My feeling is that computer lettering will ultimately prove to be good news for all concerned. If you are considering buying a computer, then make that investment before the technology overtakes you and your editor is insisting that you use a computer, rather than insisting that you don’t. I was fortunate. I became familiar with the Mac while working at Graphitti Designs. I was able to struggle for days with text boxes in QuarkXpress. Thereafter I spent one evening every week for over a year learning Fontographer. My friend Neal Sofge and I once whiled away an entire evening trying to iron out the kinks in my number 8! (We didn’t have the manual)! Persevere. I guarantee that, once you’re comfortable with the programs, you’ll be reluctant to pick up a pen again. All said and done, a good lettering font, electronically composed on the artwork at the color separation stage, saves everyone in the production process time and money. Most readers will not notice the difference, and those that do will probably agree that the lettering looks cleaner and sharper. However, only if you’re working on your craft will they note that it looks a little better. That much will never change.